75yo Bashir has been in power since a coup in 1989 but in the last two months there have been almost daily demonstrations calling for him to go. Crowds of Sudanese protesters chanted "freedom, freedom," as riot police fired tear gas on anti-government rallies in the capital, Khartoum and the city of Omdurman, on the other side of the river Nile, on Monday, 4 February. Many of the protesters chanted the name of Ahmed Khair, a 33-year-old school teacher who was detained last week and died in custody on Friday, 1 February. He was believed to be the 53rd protester killed since protests began on 19 December, initially as a result of an increase in the price of bread. 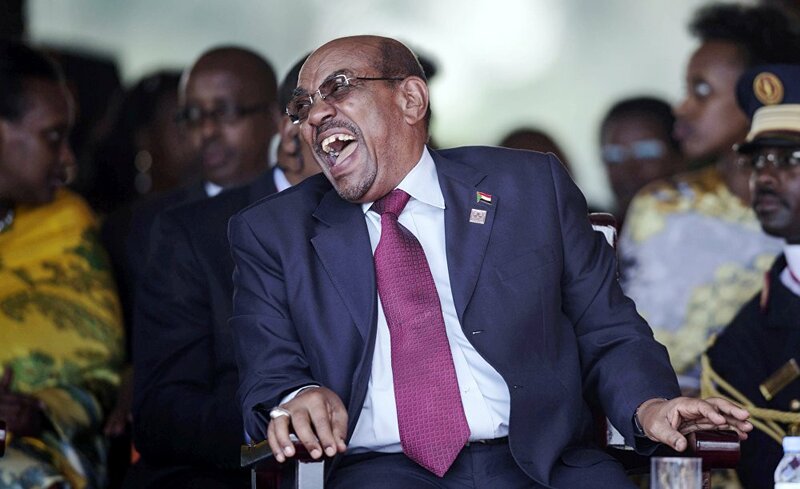 Sudan's President Omar Hassan al-Bashir laughs during the swearing-in ceremony of Uganda's president, Yoweri Kaguta Museveni at the Kololo independence grounds in Kampala, Uganda, May 12, 2016. Amjad Farid, a spokesman for Sudan Change Now, said there had been more protests on Tuesday, 5 February, especially among hospital doctors, teachers and university lecturers. "People are demanding their basic rights — freedom of speech, freedom of the press, freedom of assembly — but they also want a respectable government which actually represents them," Dr. Farid told Sputnik. He said the government of President Omar al-Bashir, which had been in power for 30 years, had failed. ​Bashir, who came to power in an Islamist-backed military coup in 1989, is considering running for a third presidential term in an election next year. "It's a failure over three decades. It's not about ideology or religion. It's about a material failure, the collapse of the economy and the loss of (largely Christian and animist) South Sudan because they could not accommodate other peoples and of course the corruption of the Bashir family and the establishment," Dr. Farid told Sputnik. Who Would Be Brave Enough to Stand Against Bashir? Dr. Farid said 3,000 political prisoners were being held in Sudan, while another 3.5 million Sudanese had become refugees. "It is an illegitimate regime and its action against its own people are illegal. Who is going to run for political office when the intelligence service can detain people without time limits? Bashir needs to go and then a transitional government is needed to allow for a new government," he told Sputnik. ​The protests are being led by the Sudanese Professionals Association but many in the Sudanese government are seeking to portray it as a disagreement between the older and younger generations. "The recent incidents show that there is a division between the young generation and others within families. This is something that needs to be solved by dialogue with the youth," Defence Minister Awad Ibnouf told army officers in Khartoum on 4 February. His comments come days after the army's chief of staff, General Kamal Abdelmarouf, said the army "will not allow the Sudanese state to collapse or fall into chaos." ​"Ibnouf is trying to portray it as a generation gap but the protesters are across all ages, it's not just young people. We have people in their 70s chanting for change," Dr. Farid told Sputnik. He said it was not just the army which was propping up al-Bashir and his National Congress Party government. Dr. Farid said one of the pro-NCP militias, which was previously known as the "janjaweed" and was notorious for atrocities in Darfur, had been given the task of cracking down on migrants heading for Egypt and Europe and was being supported in this by the European Union, which was keen to stem the flow of migrants. "People are fleeing Africa because of the tyranny and mismanagement of the ruling regimes and the corrupt leaders," Dr. Farid told Sputnik. Dr. Farid said the EU's policy was both absurd and hypocritical because most of those who were fleeing Sudan were doing so because they had lost hope in the country due to the government. ​He said the UK, the US and the EU were currently berating the Venezuelan government and trying to oust President Maduro, while "turning a blind eye" to al-Bashir. "The US, the UK and the EU are partners in crime with Bashir," Dr. Farid told Sputnik. "The EU is turning a blind eye because he has promised to stem the migrants and the international media should be ashamed of itself. Their silence about what is going on in Sudan is shameful. The government is committing criminal offences on a daily basis, including killing doctors for helping injured protesters," Dr. Farid told Sputnik.